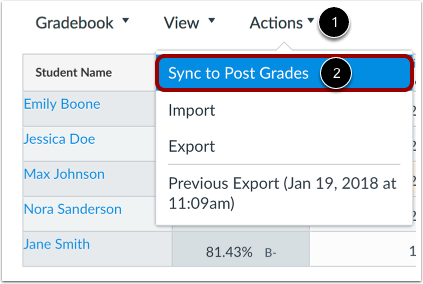 How do I sync grades to the legacy PowerTeacher gradebook in PowerSchool in the New Gradebook? If your institution is using the legacy PowerTeacher gradebook in PowerSchool as a student information system (SIS), you can use the Canvas Gradebook to pass grades back to PowerSchool. Grades are passed back if an assignment is specifically included as part of the grades transfer. 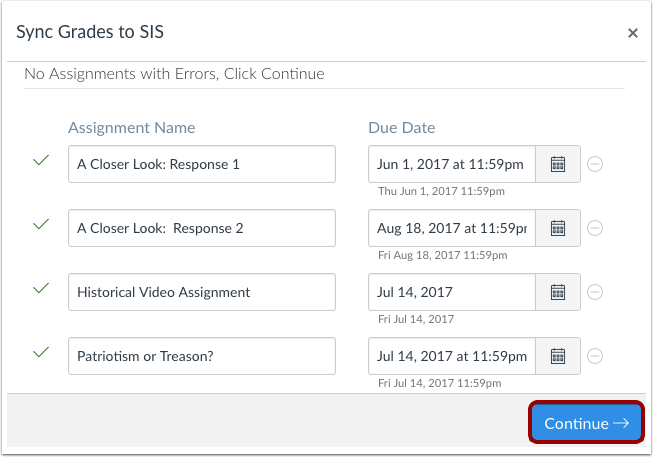 You can include grades for assignments, graded discussions, and quizzes on a per-assignment basis. View the PowerSchool integration video. This integration requires the Post Grades to SIS feature option. Learn how to manage course features. PowerSchool requires specific setup procedures before you can post grades. Depending on how assignments are assigned to students, some grades may not be able to be passed back to PowerSchool. For PowerSchool details and troubleshooting tips, view the Legacy PowerTeacher Gradebook Instructor Help document in the Canvas Community. 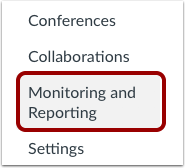 Click the Actions menu  and then click the Sync to Post Grades link . Canvas notifies you if there are any errors with your submission . 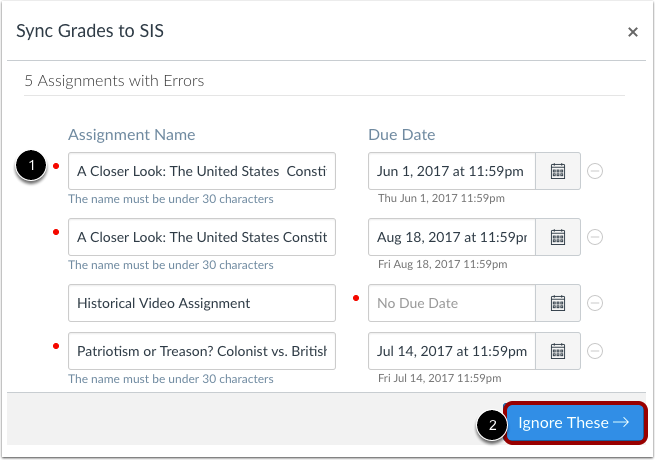 Errors usually occur because of a duplicate assignment name, the assignment is missing a due date, or both. A red dot displays next to the error(s). To ignore the error(s), click the Ignore These button . If you want to correct the error(s), update the error field(s) as appropriate. Once the Gradebook no longer contains assignment errors, click the Continue button. Canvas displays the number of assignments that will be sent to PowerSchool. Click the Sync Grades button. Note: It may take a few minutes for data to appear in PowerSchool. 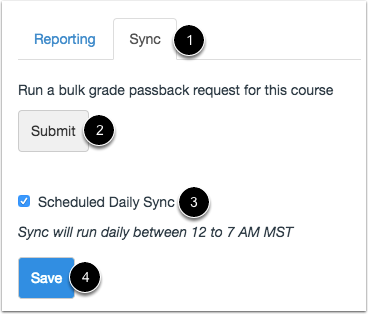 To run a bulk grade passback for all grades in your course, click the Submit button . Running a bulk grade passback sends every grade in the gradebook to your SIS. This option can be used if you notice a discrepancy between your Canvas and PowerTeacher gradebooks. 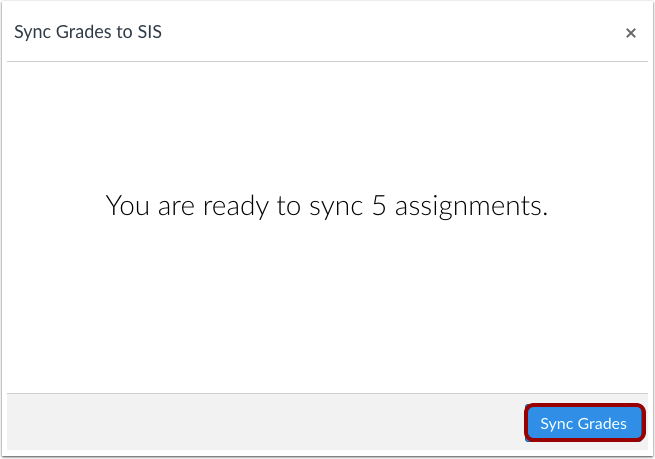 Previous Topic:How do I sync grades to PowerTeacher Pro in PowerSchool in the New Gradebook? 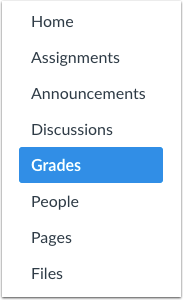 Next Topic:How do I sync grades to Infinite Campus in the New Gradebook? Table of Contents > New Gradebook > How do I sync grades to the legacy PowerTeacher gradebook in PowerSchool in the New Gradebook?